Ooooooohh yeeeaahh. Got something special today. 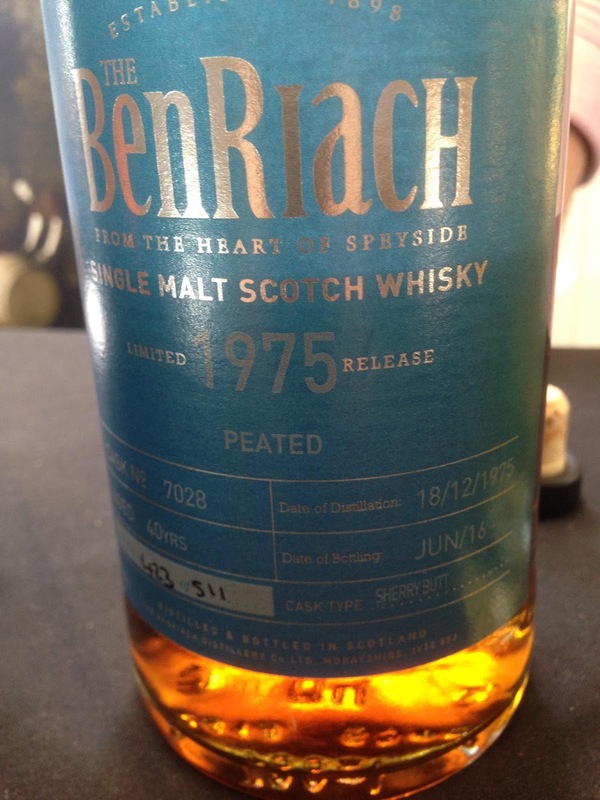 A BenRiach from their single cask range. I also had a bad experience with this 36yo Glen Grant finished in a Brandy barrel. However, something caught my eye about this one. It wasn’t a crazy finish, it’s peated and the bloody age. It’s 40 years old. Then at the show I got talking to the brand ambassador on the stand and he said that the Sherry finish was over 7 years! For me, that’s secondary maturation rather than a finish. Said brand ambassador was then rather generous with the pour! Which was great as I got to spend a bit longer with this. Nose: Wow. Seriously fruity, really tropical with what I only managed to describe as SUPER MANGO, lots of peach flesh, light spice, light oak, cinnamon. Not really any smoke that I can detect but no surprise after 40 years. Really fresh actually. After 5 mins a little smoke starts to appear. Water: More spice and oak. Taste: Big. Again that SUPER MANGO, cinnamon spice, more mango, some oak, amazingly fruity and fresh, then more vanilla continues. Water: More spiced and more oak as with the nose, a little smoke going into the finish but becomes a little unbalanced. Finish: Long length. More of that super fruitiness, mango and peach flesh.